Paula is a popular panelist on NPR's # 1 show, the weekly comedy news quiz, Wait, Wait...Don't Tell Me! 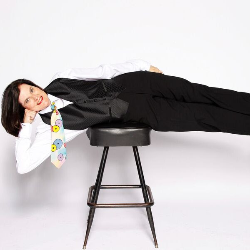 Her new weekly podcast for Maximum Fun, Nobody Listens to Paula Poundstone, is a comedy field guide to life. Each week Paula and her co-host, Adam Felber, a friend, and fellow panelist on Wait Wait…Don’t Tell Me! bring on leading expert guests and use their unique comedic sensibility to help us navigate life in the 21st century. Along the way, Paula attempts to explain existence through her kaleidoscopic perspective, and Adam tries to interject some rationality. Paula has had numerous HBO specials and starred in her own series on HBO and ABC. Her second special for HBO, Paula Poundstone goes to Harvard, marked the first time the elite university allowed its name to be used in the title of a television show. Paula was the first woman, in its then 73rd year, to perform standup comedy at the White House Correspondents’ Dinner. She won an American Comedy Award for Best Female Standup Comic and is recognized in innumerable lists, documentaries, and literary compendiums noting influential standup comedians of our time.